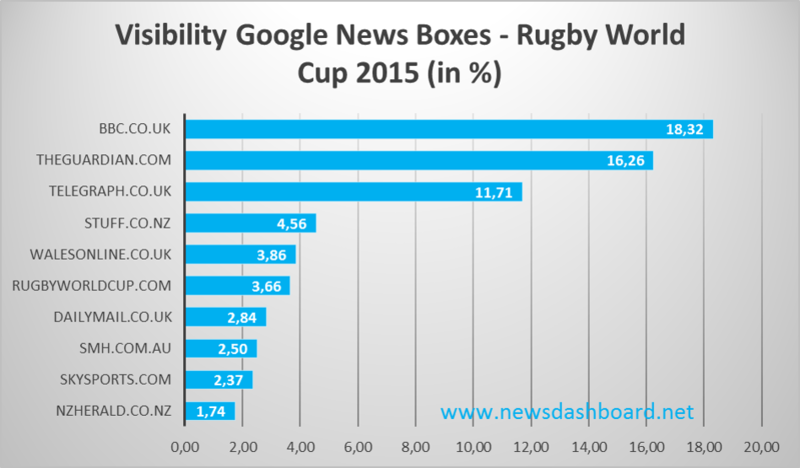 New Zealand wins the Rugby World Cup – who wins the Google News Boxes? The Rugby World Cup was the sports event of the year in England. From 18th September until 31st August, 20 teams from all over the world competed for the win of the World Cup. In the end, New Zealand was able to call itself the winner of the World Cup for the third time, before Australia and South Africa. Unfortunately, England did not make it to the quarter finals, but Wales and Scotland did. 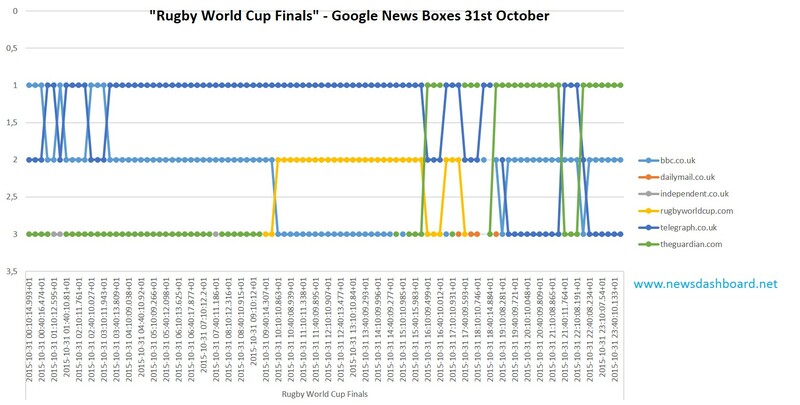 We analysed who was the winner in the Google News Boxes during the Rugby World Cup. We looked at the complete stretch from the first until the last game. We based the analysis on a set of keywords including all participating teams, the keywords “Rugby World Cup quarter finals, semi-finals and finals”, plus the general keyword “Rugby Wold Cup 2015”. It is striking that on places 4 to 10, which are relatively close together, there are three foreign news players: stuff.co.nz, smh.com.au (The Sydney Morning Herald), and nzherald.nz (New Zealand Herald). This could be due to the fact, that New Zealand and Australia played the final, that they were covered a lot, and that domestic news players enjoy high trust from Google. Walesonline.co.uk is also in front in the Google News Ranking concerning the Rugby World Cup (place 5). The Welsh team made it to the quarter finals, so it was covered a lot until then. Furthermore, the official website of the event, rugbyworldcup.com was observed by Google. Who wins the Google News Box on the day of the final? New Zealand won the big final on 31st October – nevertheless, English news players win the Google News Box on that day. Especially telegraph.co.uk and theguardian.com are leading most of the day. Until the start of the match at 4 pm, telegraph.co.uk was almost completely on the first place of the Google News Box. So this news player won the preliminary reporting that day. From 4 pm on, the guardian.com was leading most of the time (view following chart). The other positions are mainly covered by bbc.co.uk and rugbyworldcup.com, independent.co.uk and dailymail.co.uk make it into the Google News Box occasionally.